Keith went above & beyond to make sure our group had a place to stay after discovering our reservations were made for the wrong weekend. We hadn't realized the mistake until we were on the way down & Keith immediately sprung into action to help us. We were amazed by Keith's helpfulness in finding other accommodations for our group during a festival weekend with very little places available. All of us would recommend Flip Flop to all of our friends & would love to stay again in one of their rentals. Couldn't be more pleased with our experience. The property was gorgeous with spacious rooms that could fit our group off 6 adults comfortably. It was extremely clean and well stocked for things any guest would need. The community was very close to the beach while remaining very private and out of the hectic traffic. Keith from Flip Flop Vacations is hands down the most kind, easy to work with person I've ever come across. We originally booked a beach house through him via Airbnb to attend Hangout Music Festival. Unfortunately, we accidentally booked the dates for the wrong weekend without realizing until about 4 hours away from Gulf Shores. Keith was super calm about the entire situation and helped relieve a lot of stress. We were able to cancel the wrong dates and Keith went above and beyond to find us somewhere else to stay for the weekend last minute. You just don't get that kind of service anywhere else! The southern hospitality was much appreciated. It was our first time coming down for the fest and we absolutely will be back next year. The first person we will call will be Keith from Flip Flop Vacations. Next year I'll triple check the dates ;) See you next year. The property we ultimately switched to was beyond what we expected. Everything was clean and nicely decorated. The check in and check out process were very simple and communicated well. The only very minor issue we had was the ice maker not working properly but it wasn't a problem at all as we just bought a bag of ice instead. Thanks again!!! My family and I had a wonderful time at t he Flip Flop Repair Shop! The views are beautiful and the home was so nice, just as described in the listing. We lounged by the pool. The guys took out the kayaks multiple times a day, went fishing, saw dolphines, and played horseshoes. I would highly recommend this vacation home! This was the first time my wife and I visited Gulf Shores since our honey moon 26 years ago. Now we can't wait until our next trip. We would certainly choose this property in the future and highly recommend it to anyone planning a trip to the area. It is very spacious and comfortable and also well equipped for cooking and entertaining. The location is great with a very short walk to the gulf. I can't say enough about the amazing views of the spectacular sunsets and sunrises over Little Lagoon from this property. The additional apartment downstairs was a very nice arrangement for my father in law who likes to go fishing at 4 am. He was able to come and go without disturbing the other guests. Looking forward to our next visit. We absolutely loved Flip Flop Repair Shop....already booked another week in October. That says it all! Thank you, Keith! It was great locations, and the condo was very clean. Keith was an excellent host, and answering everything we needed to know. Pleasant and quick to respond to inquiries. Nice landscaping, perfect setting with access to boat dock. The condo very spacious, clean and made for a very relaxing stay. Of all of our stays, this has been by far our favorite. Easy check-in /out. We will continue coming back. Phenomenal Christians who were extremely helpful!!! Very nice accommodations for a serene stay!!! I plan my 1st annual couples retreat and it was wonderful, the house was everything and some.I really wish he would take more pictures of the house ,because the pictures don't do the house justice. Everybody was happy with the house and we all are looking forward to our stay next year.This house is a must see. Stayed in this unit for a girls trip, upon arriving we found the unit to be very accessible and nicely furnished. There was ample room for 5 adults, even when getting ready for a night out. Unit was clean inside and out, nice balcony view, security noted at front desk, and nice outdoor facilities. Would definitely go back and recommend to others. We stayed there from 12/6 to 12/10. Our parents are still there. We loved it. Very clean. The furniture was in great condition. The beds were comfortable. The refrigerator needs to serviced due to the ice machine not working. Everything else was perfection. MANAGER REVIEW: The refrigerator's ice maker has been repaired. We had such a lovely time staying here with our kids & dogs!! The beach was perfect for everyone. And the house was perfect (make sure to enjoy the back porch swing at sunset!). And even though our visit was in January & cooler, the boys enjoyed a midnight swim Thank you! 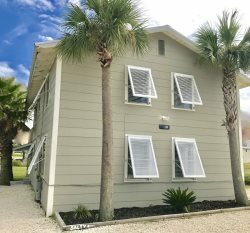 If you are looking for a getaway from it all vacation spot with private beach, swimming pool, great bay views to watch Dolphins with privacy, this is your place. This is a great place to relax, well decorated in a very quiet location. Keith, the owner ,was awesome and took care of any issue or question we had immediately and he lives nearby. Go ahead and prepare yourself for a fifteen to twenty minute drive to restaurants but You get used to that after a couple of trips. Great privacy and great to work with owner !! Thanks Keith. The only thing...was I called Keith about the shower. We were unable to get it working. I never received a call back. Luckily we were able to get it working. MANAGER RESPONSE: I did inspect the shower and found it to be in working condition. I'm sorry I did forget to call you back. Our unit had an awesome deck!! Very roomy. Great view! The fan motor on the air conditioner is very loud. My husband, our small poodle, & I enjoyed two fantastic months at Rising Tide this last winter! It was a wonderful home-away-from-home for us. The pictures are great representations of the home.....lots of space & everything you could need to cook, etc. The view of the Lagoon is so peaceful, and being able to walk 3 blocks and be on the beach was wonderful! Plus, it is close to restaurants and a short drive to shopping. Everyone in Gulf Shores is so friendly, too! The house was probably too large for us, but it was so nice to have the space when an occasional relative couldn't stand the snow back home and would drive or fly down for a short visit. Keith, the manager, was quick to respond to any questions or concerns. We will definitely be going back next year +. Thank you for a great way to start our retirement! Wish we could have stayed longer to really enjoy the beach and warmer ocean! They were very friendly and courteous. They were quick to respond to our concerns. They property was everything we expected and more. It was spacious, modern, and had a great view. First I was there a year ago Spring Break! We came all the way from WI. The house and the grounds were wonderful! A short drive to Gulf Shores. We loved the house and the pool and private beach next to the house. Keith was amazing the wireless didn't work at first he fixed it right away. Love this place hope to be back in 2017! Love it! Everything was ready for our arrival, no worries, home away from home. Love that we could cook, everything needed was there. Quiet, no loud music, no loud people, safe. Thanks to Keith Morris for taking care of everything! Condo in desperate need of attention, appears to have been neglected with little or no maintenance for some time. Recommend the building, however, not this unit. MANAGER RESPONSE: performed walk thru with the owner and very minor issues needed addressing in regards to maintenance. All bedroom TV's were replaced with flat screens.